All Dog Breed Photographs on this web page copyright Michael M Trafford except where otherwise stated and we do thank Michael for allowing the Club to use them. The Finnish Spitz, known as the Suomenpystykorva in Finland, and considered the national dog in his native country, the breed has existed in northern parts of Finland and Lapland for thousands of years. This is a hunting breed of small game and birds who barks in order to bring the hunter to him with his voice. Courageous, faithful, and has the manners of a true gentleman.Makes an ideal family companion and is especially good with children and a superior watchdog. 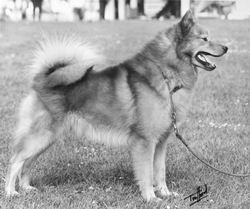 The Finnish Spitz was accepted into the Finnish Kennel Club in the 1920s and, in 1935 the breed was officially recognized by the Kennel Club (England). The Finnish Spitz has a fox-like appearance with a pointed muzzle, erect ears, dense coat and curled tail. He has a well-balanced body without any exagerated features and a beautiful red-gold coat. The Norwegian Elkhound is the national dog of Norway. In their native land, Elkhounds have been used to pull sleds, guard home and family, perform mountain rescue, hunt big game such as elk, moose and bear, and track for long hours in all types of weather and terrain. The Elkhound's very acute senses of smell and hearing aid him in performing the functions he was originally bred for - to hunt and track large game. The Elkhound is bold, energetic and was built for endurance and stamina. The breed is not aggressive by nature and known to be friendly even with strangers. However, can be protective of the family and property and with their deep bark and intimidating appearance, makes a good watchdog. Also noted for being good with children and makes an excellent family companion. The Elkhound is very energetic and requires daily exercise. 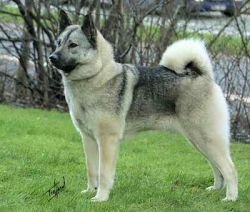 In appearance, the Elkhound is a typical northern dog of medium size, square in profile and balanced in proportions. They have the typical prick ears and a tightly curled tail which is carried over the back. The Elkhound's coat is thick and hard but smooth-lying. Grey in colour with black tips to the long hairs. Thank you for visiting our site and do sign our guestbook to let us know you were here!